Objective of visit: To find early structures in Skagafjörður (in the North of Iceland) with geo-physical methods, both to make an inventory of these structures and, at the same time, to prove that these methods are effective. Fellow visitors: Members of the UCLA-NSF Skagafjörður Archaeological Settlement Survey, directed by Dr. John Steinberg. 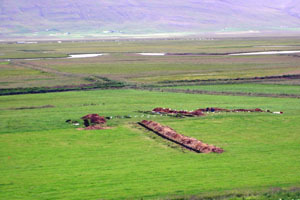 Several sites were surveyed and excavated, including Glaumbær (shown above), Stóra-Seyla, Hof and Reynistaður. Some of the results can be found in J.M. Steinberg og D.J. Bolender, "Rannsóknir a búsetuminjum í Skagafirði," Árbók hins Íslenzka fornleifafélags 2002-2003: 107-130. Approximate position and date of the site: Iceland was one of the last major land masses to be colonized by mankind, making the Viking structures the earliest human remains in the area. They date to before 1100 AD and possible as early as the 9th century AD. Short description of the site: As the structures were built of turf, which has long since decayed, very little of them is now visible on the surface. When excavated they show clear traces in the profiles of the trenches, between natural layers of tephra. These are the volcanic ashes that rained down after each of the recurrent eruptions on Iceland. The layers of tephra greatly facilitate the dating of the structures once a structures has been located. this can be done using the historical sources (the saga's) or geo-physical techniques looking for the specific signature of ancient turf walls. My work in Iceland would not have been possible without the SASS-project.